Come and discover over 1300 years of history under one roof! FREE GUIDED TOURS are available most weekdays from 2-4pm between April and October each year. These short highlight tours take you back in time to the foundation of All Hallows in 675AD, and lead you on a long and fascinating journey right up to the current day. Tours leave on demand rather than at set times, and we suggest you arrive before 3.30pm to allow enough time to look around. HERITAGE TOURS FOR GROUPS are available by arrangement throughout the year. Led by our qualified Guides, the tours present an opportunity to hear first hand about the long and colourful history of All Hallows. These tours last approx one hour and must be pre-booked, and there is a charge of £5 per person. We suggest a max of 15 per group, but larger numbers can be accommodated in several groups if required. Please contact the church office (020 7481 2928 or email parish@ahbtt.org.uk) for details. If you are planning to bring a self guided group to the church, please contact the office before your visit to make sure it is a convenient time, as we have many services and events taking place in the building throughout the week. All Hallows also offers a series of guided walks around different aspects of the City led by an experienced City of London guide. The walks cost £8 per person and take between 90 minutes-2 hours. No need to book in advance, just turn up on the day. 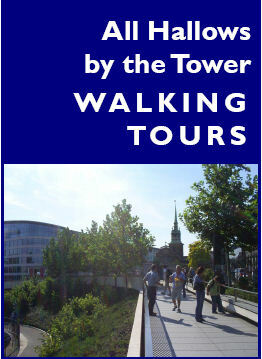 The walking tours leaflet has more details about the content of the walks and their departure points - click on the image to download a copy.